Belotsky, a member of mayoral hopeful and opposition leader Nir Barkat’s faction, adds that “The municipality would be perfectly happy for it [the library] to disappear.” She admits that the municipality is indeed stretched thin by the size and activity of the Russian Library. One suggestion has been to upgrade the library’s status to that of a national library, but this would involve moving the library under the auspices of the Culture Ministry, a long and complicated process, and wouldn’t address the immediate matter of vacating the Zuckerman building. 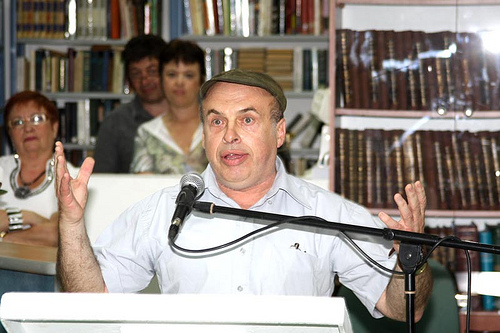 After a long and troublesome history in its relationship with the municipality of Jerusalem, the library finally has a place of its own, with an opening ceremony attended by Natan Sharansky (video news about it in Russian here).Â Trivia tidbit:Â I once met Natan Sharansky for ten minutes in Jerusalem.Â This makes me a minor celebrity in my family.Â C-list, at least. This is from the event’s Flickr stream. Let there be Sholom Aleichem! HOLDING SOME 100,000 books, Jerusalem’s Municipal Russian Library is the largest public Russian-language library outside the former Soviet Union, and the world’s largest library of books translated from Hebrew to Russian. There are self-help books for everything from learning languages to using computer programs and entire collections of rare Soviet journals from Stalin’s time. There is even a section of anti-Semitic Soviet books from the 1970s, most of which were written by Jews. Oh, good God. It’s happened. My Russian proofreading assistant Vanya ran off before he finished looking at this piece. Please have pity on poor, alocholic Vanya, because he was brought up in Krasnodar and has no idea what a mezuzah, menorah, or mehitza are. I will now go beat him for his indiscretions. Nice article about the opening, and we’re glad you chose to reference natansharansky...! 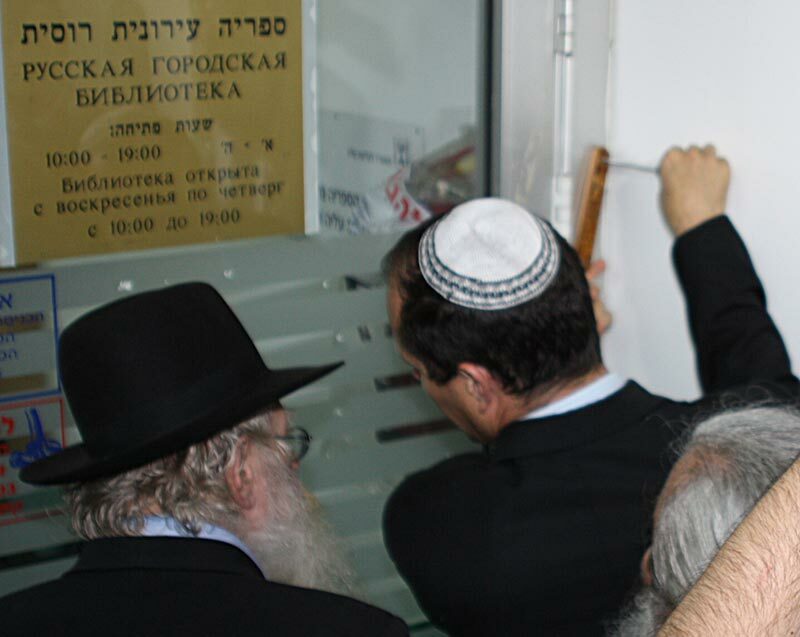 Can someone please tell me what is wrong with a Russian library in Jerusalem? I am as big of a believer in the revival of Hebrew as anyone, but who is being harmed here? There’s nothing wrong with a Russian library in Jerusalem, Jason! In fact, quite the opposite. I am very, very excited about it, seeing, as how, you know I’m Russian and Russians are big on literacy in Russian. And maybe I wanna read a little Pushkin strollin’ down Ben Yehuda.